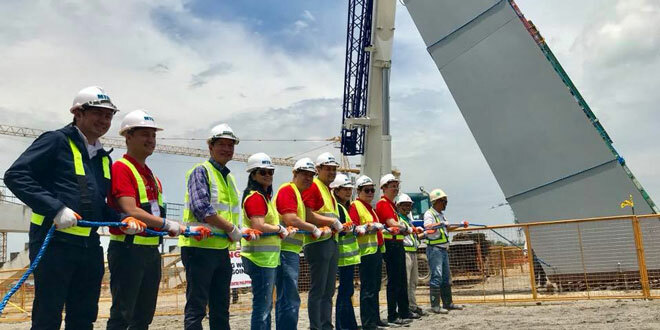 Foreign Affairs Secretary Alan Peter Cayetano, chairman of Philippine SEA Games Organizing Committee (PHISGOC), leads the installation of steel columns at the Sports Stadium at the New Clark City - National Government Administrative Center (NGAC). With him are the other members of PHISGOC, local government officials, and MTD Clark, Inc. The Bases Conversion and Development Authority (BCDA) said over the weekend the construction of sports facilities for the country’s hosting of the 2019 Southeast Asian Games remains on track. On Saturday, Foreign Affairs Secretary Alan Peter Cayetano, who chairs the Philippine SEA Games Organizing Committee (Phisgoc), visited the construction site in Capas, Tarlac. The world-class sports facilities will be part of the 40-hectare National Government Administrative Center (NGAC) Phase 1-A projects in New Clark City in Capas, Tarlac. The NGAC, including the SEA Games facilities, is being developed by Malaysian company MTD Capital Berhad — BCDA’s partner for the development of NGAC. The sports facilities inside the NGAC include a 20,000-seater athletic stadium and a 2,000-seater aquatic center that would be compliant with FINA Olympic standards. There will also be athletic dormitories that can accommodate up to 1,000 athletes. Earlier, MTD Philippines, Inc. Chairman Isaac David told the Philippine News Agency that the company has more than doubled the number of equipment deployed in the construction site to meet the deadline of completion of the sports facilities.